THE Ladies Gaelic Football Association Leadership Programme has been devised to develop the next generation of female leaders within Ladies Gaelic Football. The course is delivered over 12 months by experts in the fields of coaching, officiating, administration and PR/Media. The expert trainers will impart their knowledge in key areas impacting the development of Ladies Gaelic Football. There are 20 places available, 5 for each strand of the course. Participants will be supported in developing their leadership skills by being personally mentored by an assigned expert for the duration of the programme. 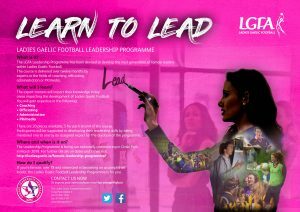 If you’re female, over 18 and interested becoming an accomplished female leader, the Ladies Gaelic Football Leadership Programme is for you.